Which Team Fortress 2 items are worth your money? TF2 now sells items. We've already interviewed Valve and offered our big-picture response to the update as a whole, but I wanted to give à la carte reviews of the new arms. As these equipments are still mostly unknown quantities, that's put the community in a position to make blind purchases--I'm here to tell you not to impulsively purchase a writhing, $5 digital fish to assault other players with, no matter how tempting that premise is in your mind. I've punched $70.36 worth of money from my wallet so I can evaluate it all. Read further for my yays and nays, conveniently ranked by which items are the most dollar-worthy. First: I'm universally vetoing the wallet-eating, $17.49 hats (Familiar Fez, Grenadier's Softcap, The Milkman and The Attendant), but it's worth noting that you need them to complete any of the new class-specific “item sets” which each confer additional bonuses when you're wearing all three items. At that price, it's smarter to drop $20 (currently on sale from $30) on the class-specific bundles, which unlock all the items from this update for a specific class. It fires darts filled with pee. This is now TF2's most satisfying device for setting up kills and earning assists; wetting an enemy with a bodyshot, then following up with another dart is usually a guaranteed takedown. A side-benefit is that it lessens the frustration of trying to line-up skullshots and replaces it with, well, trying to distribute your urine to the entire enemy team. In summary: all the accuracy of the stock sniper rifle, but with your unique, demeaning biology appended. What more do you want in a gun? My now-favorite Scout weapon, but not so much for its target-slowing trait as its focused firing. The Shortstop spits four pellets--six fewer than the normal Scattergun, but feels like it has equal or comparable harassing and killing power. It's more accurate over long distances, and also boasts a faster reload time than the existing Scatterguns, with the added benefit of reloading its entire clip at once instead of individual shells. The new standard. Brilliantly, the steady +15 HP per hit The Black Box returns when you damage an enemy isn't relative to how much hurt your rocket deals--a glancing blow on a Heavy grants the same amount of healing as missiling a Medic straight in the jaw. It's also something of a training tool for learning how to conserve your rockets. Dolling out a few of these on our server (and being the recipient of one myself), the frivolous fun of tossing an item to a random player on your server is a pop of joy mid-game. Be warned that the hidden loot inside may be an older TF2 item (I can't confirm if that includes hats), and be aware that they're not exploitable--gifted items aren't tradable and can't be broken down into spare metal, even if they're items from previous updates like The Wrangler. In the moments I've found myself before standing over a car battery, I can accurately say that I've said to myself: “I would like to hit a man with that.” The Powerjack is a no-brainer for even moderate Pyro players, boosting the damage output of all weapons by a quarter and restoring a chunk of HP for every kill (melee or otherwise) you make. Powerful. 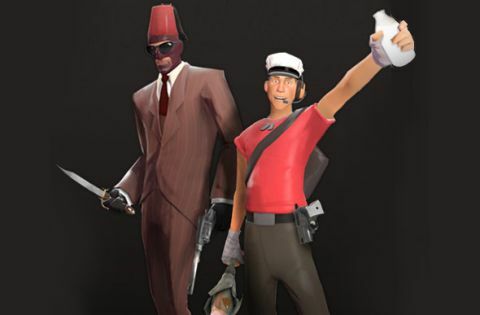 Scouts: the Boston-accented mosquitoes of Team Fortress 2. They can jump twice before hitting the ground, their mother is more attractive than yours, and their twig arms still manage to hit home runs. Through dark science, they can now also heal themselves by coating you with milk, then shooting you. That's an incredible bonus for Scouts that like to fire while retreating, but at $5, you're better off trying to craft it. For now, the novelty of seeing “FISH KILL” stamped on the death notices isn't worth a hundred nickels. A missed opportunity for a unique taunt animation, too. +30% movement speed (only when equipped) at the cost of a -50% damage debuff. I can't endorse a one-dimensional, five buck unlock for the Heavy, even if it's a great escape tool. I'd say that they're cool to look at, but posing with them causes you to take six damage each second. This is a bonus item, so I'm a little unsure how to rank it. I got one for making $20 worth of purchases. On death, you retain up to 20% of your stored Ubercharge, while losing 10% max health. Losing that slice of life (especially since Medics auto-regen a little on their own) for "uber-insurance" is a no-brainer. The defensive cousin of The Buff Banner. Smart for payload maps where you're usually grouped-up with teammates, but being selfless isn't worth $5. The Degreaser's fast weapon switch feat is lightning-quick--designed for heatmakers that like to quick-toast enemies and then finish them off with a swing of the Axetinguisher, but no one else. This is the Spy's first-ever replacement for his knife. It's made impotent by the trait that if you poke a Heavy in his spine, you auto-disguise yourself as that class, inhibiting your ability to chain kills together when your footspeed automatically slows to that of the last character you killed. Recharge your cloak battery with potshots. An unimaginative utility item for Spies that like to operate in the open. Another overpriced weap. Only useful when paired with Jarate attacks, and barely indistinguishable from the Tribalman's Shiv and the Sniper's stock Kukri. A croc cape isn't worth five bucks. Useful only to conservative or Snipers offended by Jarate, as it occupies the slot of one of TF2's best items. Hold on, these are consumable ? What the hell. You get five duels, initiated by equipping the item from your backpack, hitting H, and selecting the player you'd like to spar with as a metagame within your match. But bizarrely, duels don't last an entire map--just a round within that map. In other words: if you initiate a duel with someone with two minutes remaining on the second stage of Dustbowl, it'll only count kills within the context of those two minutes. Winning a duel grants you a badge that tracks your wins and win percentage in duels, levelling up metallically as you win more. Not usable with any weapons; at the moment, you can only pour paint on a handful of hats. The end color isn't especially bright, either.